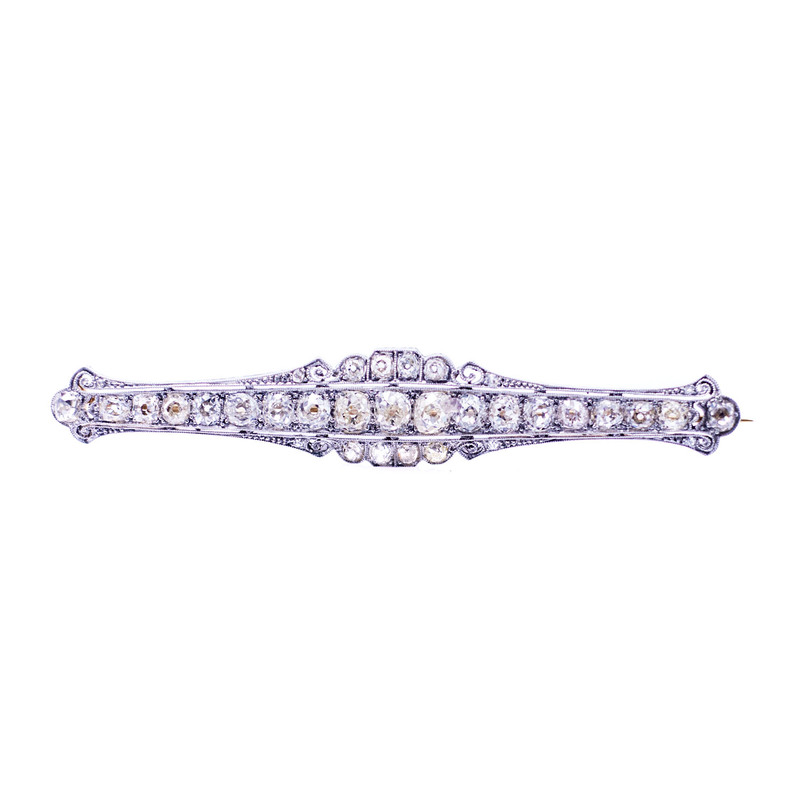 This Edwardian/early Art Deco brooch measures 3 3/8 inches long and 5/8 of an inch wide in the center tapering to 1/4 of an inch on the sides. It features a course of 19 graduated, bead set old mine cut diamonds, bordered on either side with 6, smaller graduated bead set old mine cut diamonds all set in a beautifully embellished mounting with pierced scroll-work and milgrain detailing. The reverse side of the brooch featured an 18K yellow gold straight pin closure. Ten bead set old mine cut diamonds, measuring 4.30 - 3.80 x 3.80mm (depth est.) approximate total weight of 10 Stones = 3.80ct. One of the diamonds is chipped. Four bead set rose cut diamonds, measuring .90 - .90 x .56mm (depth est.) approximate total weight of 4 Stones = .01ct.